Two Stanford University student-athletes visited the 4th and 5th grade classes at Canyon Heights Academy on May 24. 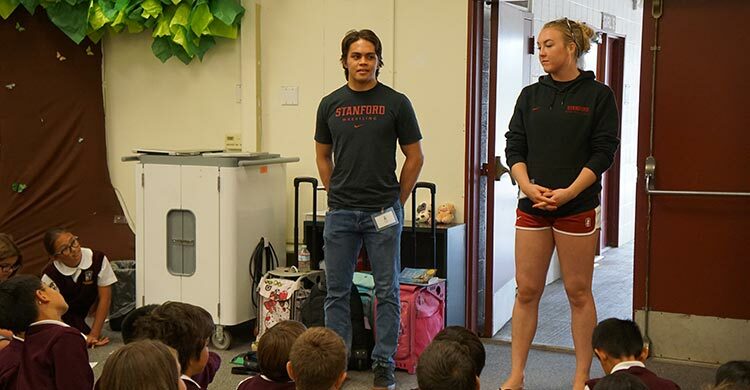 Alexis Frostaid (Women’s Volleyball) and Nainoa Calvo (Men’s Wrestling) discussed what it is like to be a student at Stanford University as well as an athlete for their teams. The students learned about the lives of student-athletes and the number of hours needed for study and training. Student-athletes from Stanford University visit school classrooms as part of a program called Classroom Cardinal. Stanford University fields 36 teams and has over 800 student-athletes. Canyon Heights students were able to ask questions of the athletes including asking about their favorite subjects and how many games they’ve won. The final question asked how they handle losing a game. The reply was a good lesson for everyone: after focusing on what I did wrong, I think about how I can improve for the next time so my game gets better. No matter what, don’t stay stuck on what went wrong.